Does anyone know how it will work? I don’t think we will have to worry about micro transactions. From what I can gather the Myki will be it’s own digital card. So you’ll still have to top it up, and the transactions will show for your Myki card, not your bank card. That’s a lot of $0 taps in that screenshot. I still carry plastic for the times where Amex is not accepted (fallback to my Visa/MC) or you need to insert Amex. It still happens, years on from Apple Pay’s launch with Amex. To be honest Apple Pay Cash is not that big of a deal given the current climate and with the rollout of the new payments platform in Australia over the next year. Also as the rollout pushes out more and more it’s going to be less relevant in the market. If the banks step up their implementation and make some minor changes which they probably will once all the banks are on board it’ll be a great cross platform financial institution independent option. The real benefit from Apple Pay Cash in Australia in my opinion would’ve been to stick it to the banks that are holding out on rolling out Apple Pay but by the end of the year I highly doubt that’s going to be an issue but will see I’m sure our banks can be very stubborn. Regardless there is a lot of issues with Apple Pay Cash that I’m sure Apple would like to solve before they push it out to more than one market. It also requires them at this stage to partner with someone unless they’re willing to take the financial burden of licensing and meeting regulations in each individual country where they choose to roll the feature out. I’m sure this is got more to do with the way Apple likes to do things they are currently running a limited public trial and as far as I’m aware Apple is probably the ones that are not allowing them to run the trial on the Apple Wallet Platform. As I’m not aware of them running any trials with any other transport system in the world you’re pretty much announce it and roll it out or you develop in secret and release when you want to make it publicly available to everyone. If Apple was willing to allow some kind of test program they would probably want it to be done in public with a partnership with Apple announcing it with them. I don’t think we will have to worry about micro transactions. From what I can gather the Myki will be it’s own digital card. Correct it’s going to be rolled out as a transport card with in Apple Wallet. 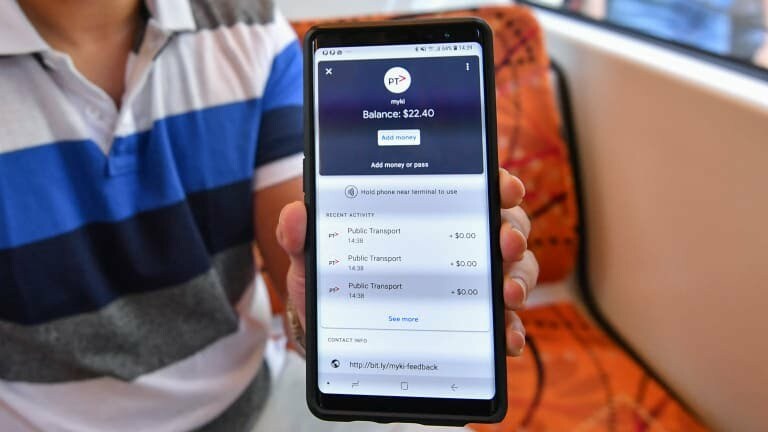 In my opinion I do like this option however it is tourism hostile for visitors so they should also in my opinion support generalised contactless payments on the network as well but given the technology they are using for their readers that may not be an option like it is for the Opal card. Unfortunately androids implementation in the Google Wallet is more further along and has more features than Apple when it comes to transport cards. Apple Pay Cash is ‘less relevant’ when you only think of a payment going through instantly. However, the reason I am keen on Apple Pay Cash is the convienience factor. Being able to pay someone whilst in conversation, including auto-suggestions Of requesting/sending a payment. One example is a friend messages me and asks if they can borrow $10, the auto-suggestion for Apple Pay Cash comes up and I tap it, enter the amount and confirm the payment. My friend sees immediately that I have sent it through. Now, is it really that hard to swipe over to your banking app, log in, tap transfer/pay someone, select an amount and contact to send to, then swipe back to your messages app and tell them it’s done? Not really, but it would be much nicer to do it in your messages app, at least for me. Apple Pay Cash is ‘less relevant’ when you only think of a payment going through instantly. The NPP is more than instant payments. However, the reason I am keen on Apple Pay Cash is the convenience factor. Being able to pay someone whilst in conversation, including auto-suggestions Of requesting/sending a payment. That convenience factor you talk about is monopolised by Apple for what reason I don’t really understand given some of the things they let the banks do via Siri. And what happens if that friend happens to be a green bubble. Which could become a major issue given the current pricing structure for an iPhone. I’m not saying I don’t disagree with you the Apple Pay Cash feature that allows you to pay people is good and it is well implemented but banks are trying to do new things with the NPP. Some of the neobanks are trying conversational payments which allow you to have these paid back I owe you request conversations in your banking app which people are looking at ways to extend that cross platform cross financial institution. And then you’ve got banks if you’ve got “Bob” for example saved in your pay anyone address book with your bank that allow you to say hey Siri “Pay Bob $100 back for lunch”. Which will normally launch your banking app wait for you to quickly authenticate with Touch ID/Face ID automatically have the pay anyone window open and with Bob’s details filled and all you have to do is click pay. Apple Pay Cash is obviously only something you’d use on an apple device, so that’s already established. It’s not something you’d expect everyone to use, just like iMessage, FaceTime or an iPhone. Almost everyone that I would possibly be exchanging money with in personal use cases have an iPhone, so on the off chance I have to send/receive money from an android user, I’ll just do it the old fashioned way for that exception. I personally don’t want to have conversations in a banking/third party app about amounts owed when I can just do that in the stock messages app where I’d be talking in the first place. Beem It is an app that’s trying to get you to use them for personal payments but anyone you pay cannot receive your payment unless they sign up for the app within 14 days. Obviously Beem It isn’t the whole picture, but it’s an example of a banks attempts at changing the way you send/receive money with people you know in a way that doesn’t appeal to me. There’s other stuff brewing of course and different ways the banks are going to approach personal payments but from what I’ve seen so far, Apple Pay Cash is the most appealing to me. I absolutely will be keeping an open mind though, especially since we may never get Apple Pay Cash. I personally don’t want to have conversations in a banking/third party app about amounts owed when I can just do that in the stock messages app where I’d be talking in the first place. See I’d like to handle all my money related stuff and request for payments or money in my banking app. Beem It is an app that’s trying to get you to use them for personal payments but anyone you pay cannot receive your payment unless they sign up for the app within 14 days. My opinion on this is, Was three banks giving a big f**** you to something I can’t understand they needed to give that to considering they were required to do the New Payments Platform. But I’ve got a feeling this app was in development and was supposed to be a middleman app between the time before and after the NPP and it was just delayed and just entered the market just before the NPP rolled out. Obviously Beem It isn’t the whole picture, but it’s an example of a banks attempts at changing the way you send/receive money with people you know in a way that doesn’t appeal to me. It’s also a different way of doing it outside the New Payments Platform. As it relied on technology that existed before the NPP. It’s actually quite interesting how they do it it’s a debit done on your Mastercard or Visa that is then instantly reimbursed to the person you’re giving the money to using the eftpos network to that persons bank account with the card linked in there Beem It account and interesting use of dual scheme debit cards and the existing payment rails. But yes I agree with you I don’t find it useful at all other than to meet eligibility requirements for ING accounts. My opinion the better way is the customer uses their own banking app and use the New Payments Platform and transfers the money using a PayID for that person. Yeah for the New Payments Platform continuing to roll out and Open Banking while delayed but still on the way it’s going to be an interesting payment landscape in Australia in the next couple of years. Yeah… The New Payments Platform continuing to roll out and Open Banking while delayed but still on the way it’s going to be an interesting payment landscape in Australia in the next couple of years. There’s other stuff brewing of course and different ways the banks are going to approach personal payments but from what I’ve seen so far, Apple Pay Cash is the most appealing to me. To be honest the biggest advantage that Apple Pay Cash would’ve had in Australia is to give a big screw you to the banks here and offer a middleman card. Which is the less reported feature of Apple Pay Cash the Cash Card. But with the market now playing ball I highly doubt this is much of an issue as I think we gonna have less and less holding out happening by the big two. To be honest I would expect if Apple Pay Cash was to roll out here it would rely on some of the functionality in the New Payments Platform and don’t get me wrong I would love to have an Apple Pay Cash Card and probably would use the Apple Pay Cash functionality to send money to people as well. I just don’t know where its relevance is going to be long term in the Australian market and to be honest they would be better off using this product to continue to disrupt the payment space in other countries. Just downloaded Beem, had never heard of it. That’s hilarious obviously their fraud detection system needs a bit of an update. Yes I saw this news yesterday. That will be another card I do not have to carry. It’s now official. Westpac New Zealand on board with Apple Pay. That now means both of the two big banks holding out on Apple Pay in Australia have Apple Pay in New Zealand. Over the last couple of months I’ve been moving towards having a spreadsheet for each country called Digital Wallets Support and today I finished the spreadsheet for New Zealand and I have now pushed this live for everyone. Digital Wallets Support in NZ. Have been working on this new layout and design for several months now it takes everything I’ve learnt over the last few years and steps it up. And it serves as an indication of what will be available on the Australian version I would love people to take a look and any feedback is welcome. Publicly here or privately in our discord server or via email is fine. The Australian version will start with Google Pay and then will eventually deprecate the Apple Pay one in there as well. Work has already started on this and I’ve released it as a private access spreadsheet for people in our discord channel. We’ve also started a spreadsheet for Wallet Passes (Loyalty Cards), Transport Systems and Online/Apps Acceptance. A public release of this is on hold at the moment but time permitting should be out in a month or two. Work has already started on this and I’ve released it as a private access spreadsheet for people in our discord channel it’s currently a blank spreadsheet at the moment data will be converted over as it’s completed from the private spreadsheet but as I mentioned earlier this is not a priority at the moment. We have the mySA GOV app now, which has digital copies of our licenses and car registration. It’s actually a pretty polished app. I haven’t seen any authorities say we can use it in lieu of our physical license, so for now I still take my wallet with me when I’m driving.